We are a leading Wholesale Trader of dhootapapeshwar swarnamahayoga suvarnakalpa 30 tab and kudos ime-9 for diabetes and sugar problem from Mumbai, India. 1-2 Tablets twice or thrice a day with dashamoolarishta, Maharasnadi kadha or lukewarm water preferably after meals or as directed by the physician. It is developed after double blind clinical human trial studies on more than 800 patients. Therefore, this is a scientifically validated formulation with no side effects. First time in history where all these government bodies work together mere to bring and help people to put curb on diabetis as the numbers of diabetic people in India is increasing so vastly. 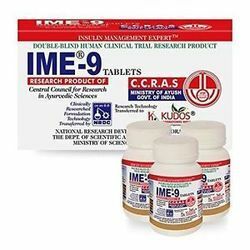 IME-9 is synergistic combination of five vital herbs viz. Karela, Jamun, Amra, Gudmar and Shilajeet. They all act by stimulating beta cells and increasing insulin production. They also decrease peripheral insulin resistance and delay glucose absorption from intestines. Two tablets thrice a day, half an hour before meals or as directed by the Physician. Looking for NAGARJUNA AYURVEDIC ?